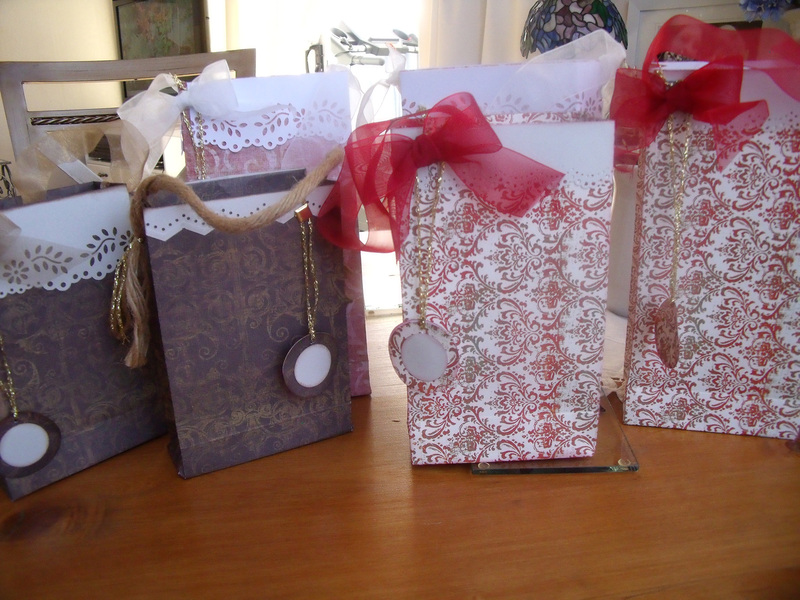 When Aged Laptops Go Bad……Make Gift Bags! It’s been 9 days since I last posted – and I’ve also been missing out on some of my bloggie friends doings – due to a lap top that has decided to stage a ‘go slow’. I was even stopped from leaving comments on some blogs I did read by my [former] flat and shiny pal! I went shopping with YD and priced new computers – its not in the budget, but I can’t imagine life without access to the blog-o-sphere, email or ‘Words with Friends’ on Facebook! As always happens to me when I go shopping, we ended up looking at something that resembled a small space craft before we realised we had some how gone well beyond our brief and needed to regroup! Now I know what I need and am waiting for the ‘pre-Christmas’ sales to start. Having told my flat and shiny former pal what is on the cards, today is a good day, and she hasn’t stopped altogether – yet……. so here’s hoping. I’m hitting ‘save draft’ at the end of every sentence just in case. I wrote a post about a week ago and lost the whole thing when flat and shiny had a major fit and shut down completely and unexpectedly and left me all high and dry….. so I went into the play room and got on with my latest project. I used a pretty old paper collection from ‘My Mind’s Eye’ called ‘Damask’, Martha Stewart punches for the top trims and loads of organza ribbon. I’ll show the rest when they are finished! 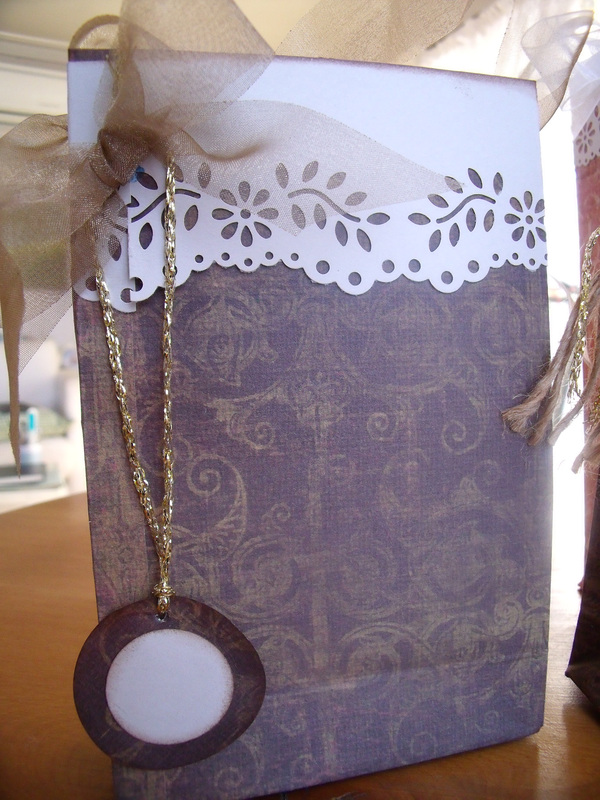 This entry was posted in Creations From My Craft Room, Paper Crafting and tagged gift bags, Martha Stewart punches, my minds eye papers, organza ribbon by thecontentedcrafter. Bookmark the permalink. These are really beautiful. Any gift would gain a very special cachet wrapped in one of those!! Thank you Anne. I like knowing that I can turn my hand to practical things as well as pictures that just sit around in journals! what a lovely presentation, pauline. the paper punched tops really add so much. Thanks again Vivian – it’s so nice that you came by for a long visit – it makes me very happy! Darn computers. Is it a MAC or PC? I had my 7 year old MAC pack it in and the Genius guys transferred everything to my new MAC. The service was awesome. Loved your project. 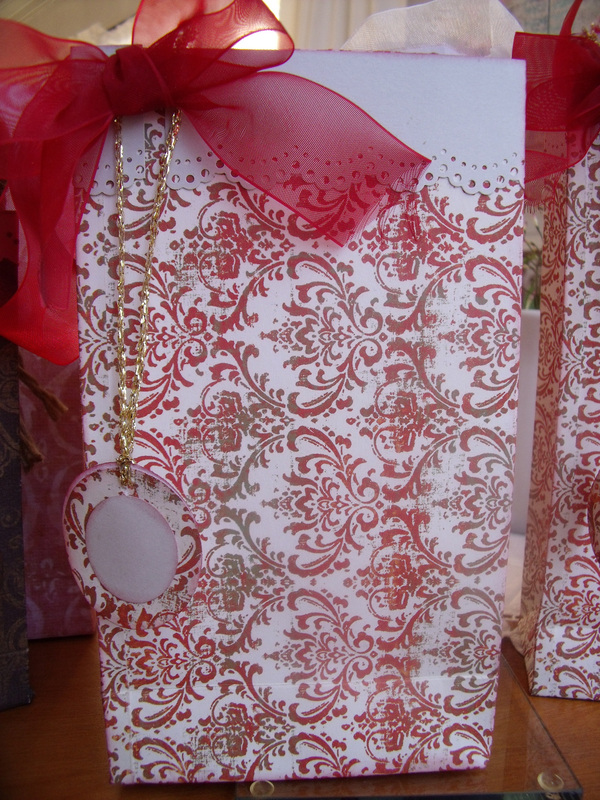 The white boarders are fun, cute and look like snow capping the perfect gift. Great way to use up supplies I would guess. Its a pc – my daughter has a mac and loves it – I wonder if I should look into that…. but no, I need a bargain! 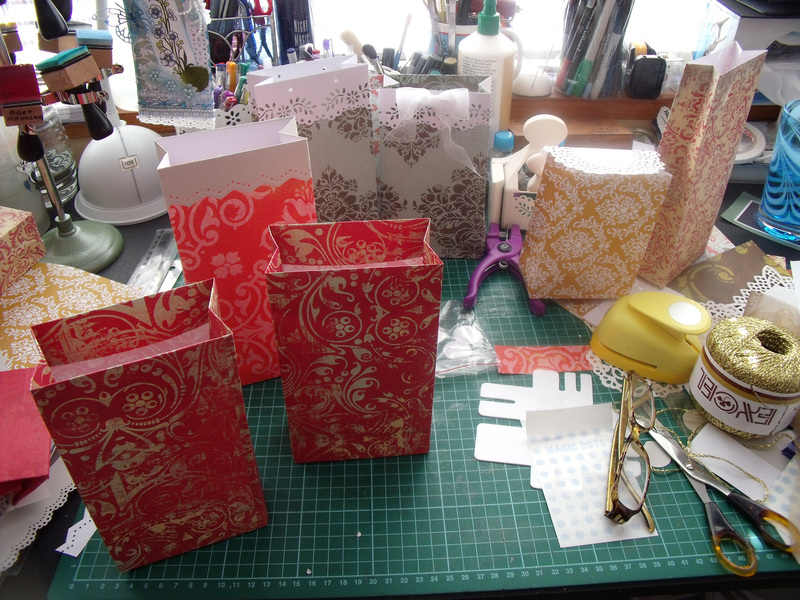 I am now full of ideas for how to make really cute gift bags – One of them is using scraps of paper, sticking them onto contact paper in a patchwork blanket effect and then making up the bag…. what do you think? oh, that sounds cool. 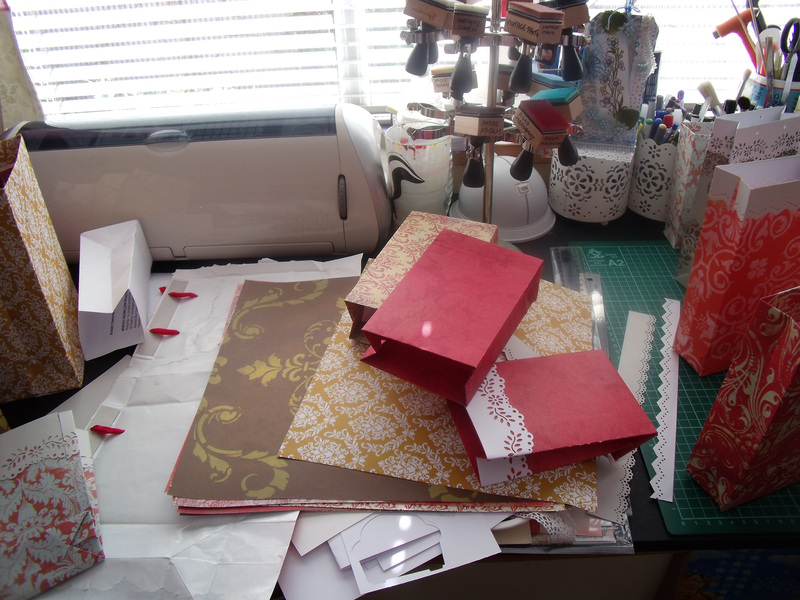 patchwork paper will be awesome. I have seen people make a ‘Story Board Collage and using it in a bunch of projects. I might be tempted to scan the patchwork and reprint it to make the bag. I’ve never used contact paper, will it still firm when you’re making folds and what not. Can’t wait to see. The first bags I made I used contact paper because I thought the paper alone would not be strong enough. It actually works quite well, you just have to be very firm with it and insist it holds a crease 🙂 Scanning is a good idea – we’ll see how they turn out…. In no particular order: LOL to the hanging macrame coffee table, hurray for the manly-man gift bags, and boo to the lap top that gave up the ghost. There really is no *good* time to lose one, but BIG SIGH that it happened now. I’ve been in that mode of saving every few sentences. There is nothing worse than losing all your work. I hope you are back among the tech world, soon. 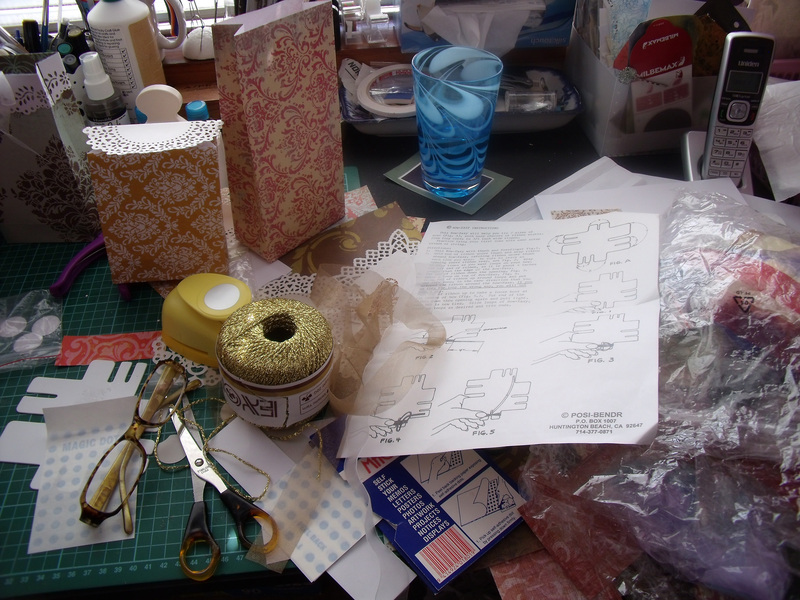 Meanwhile, love the crafty bags that are making it across your craft space. Charming. I don’t know why I’m having trouble commenting. Sorry to hear about your computer! 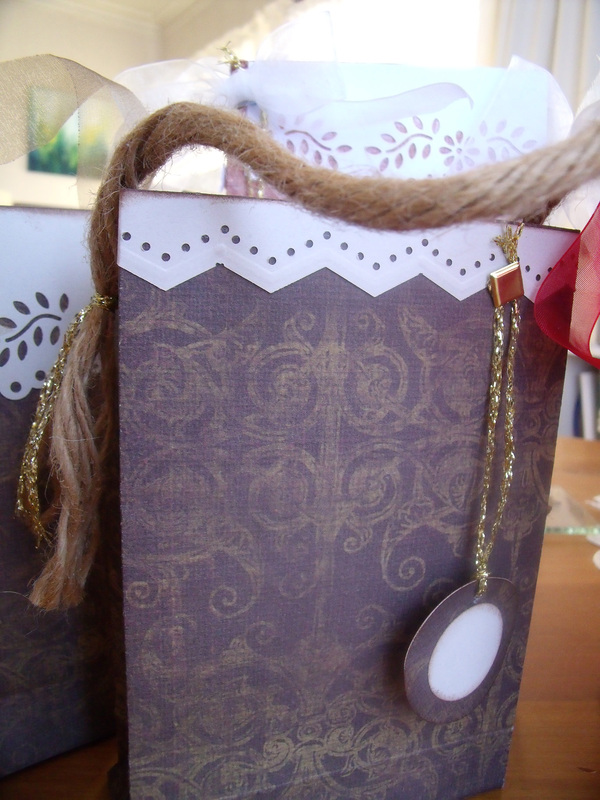 This is an easy way to do beautiful gift bags. You should sell them on Etsy!! heehehe.. I wish I could – the $$ would be helpful with up-grade costs! I love that you are so encouraging – and that my computer lasted until your 30 days ended! You are so sweet Pauline! Your support meant a lot to me. By the way, you could always use the public computers. Etsy, is free to open an account and only .20 cent to display your item. I am sure people would love your cards and bags! I haven’t thought of macrame in years! I made a macrame wall-hanging with beads in the early 1970s. Macrame must have swept the entire world back then. I love seeing your desk from right to left. 🙂 Fingers crossed for a new computer soon!